In the process of launching “Peter and the Wolf”, her fourth play with puppets, Aline talked with Arte Al Límite about the company’s work Teatro y su Doble, the crysis in dramatic areas of television and its relationship with social networks. From the feeling thet Aline Kuppenheim (49) comes back in her career. She has passed through all traditional platforms of theatre creations, being one of the most recalled soap operas. However, since a few years that is far from rating and channel competition, highlighting currently in the cinema, series and, of course, theater..
After twelve years of experience with his company Teatro y su Doble, Kuppenheim continues to learn from his colleagues, his audience and his puppets. “I think it’s a very rich language, which allows for an infinite diversity of creation. In the beginning we launched ourselves in a very intuitive and self-taught way to do theater with puppets. We had to unlearn everything we knew as actors to be able to do what needed to carry out the project, such as knowing how to manipulate and build puppets, “he says. Within this continuous process of exploration, Aline and his team found a new emotional and creative edge, where the public manifests itself in a different way before their works. The actress affirms that “the audience identifies with the puppet and feels it real, therefore it gets more excited and reflects, in a different way to how it feels before an actor.” The reception of the content becomes purer, that’s why we look for coherence to when choosing a work or text to do”. 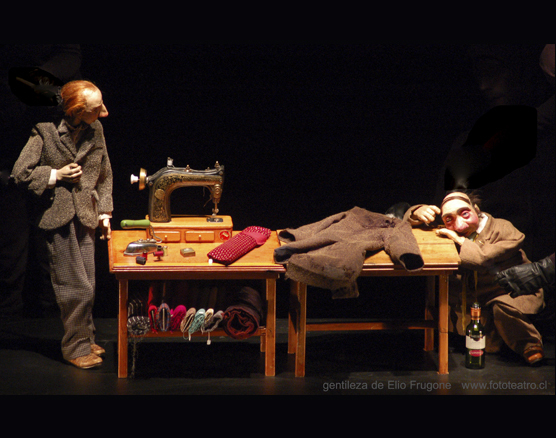 In Chile there is no tradition of puppets for adults, therefore, during the early days of the company, his works were associated with more childish ideas. For example, his first montage El Capote (2007), based on the story by Nikolai Gogol, had to be adapted for children. “It’s a pretty rough story, it’s a tragedy, we decided to adapt the story for children’s theater since it would naturally be understood that the puppet stories are for children, but our theater is for all spectators.” Soon we started changing the schedules and make functions for children and adults with the same work, “he recalls. Teatro y su Doble does not focus solely on performing functions in different scenarios: on its website they have a section called “information for teachers”, a space where the team offers workshops and special presentations of El Capote and Sobre la cuerda floja for students from 4th primary school to the last year of high school. According to her, the current crisis of the theater regarding the arrival of the public has to do with the fact that “at some point in our history we cut that relationship, then the more adult audience has already lost it. In almost all societies, theater occupies an important place, but in Chile it is seen as something far away, all of us who have been in theater work to recover that link “. That is why the team ventured to mount a fourth work inspired by the story of Pedro and the Wolf, a much more infantile cut, financed by Fondart and co-produced by the Teatro a Mil Foundation (Fitam). The assembly will debut next Friday, June 21 at the UC Theater and seeks to deepen and refine its work before this “small” audience. “The children are going to be the spectators of tomorrow and we want to form more demanding spectators and more alert about what is being offered to them”, says the actress. 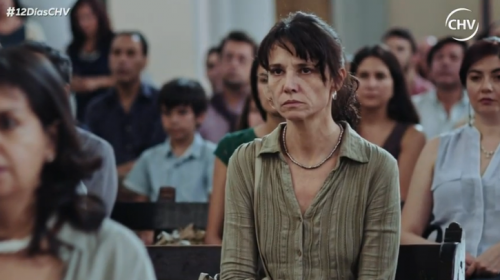 About other future projects, Aline comments that she would like to investigate the relationship between the puppet and the actor that manages it: she thinks that there are principles of the puppet that she would like to see applied in the interpreter, among them, the dispossession of the ego. The actors take second place in their works to be covered by black clothes, giving the feeling that the puppets have a life of their own, not seeing who is behind their threads. “The work with a puppet is a roundtrip, there are things that you have to ignore to manipulate a puppet and at the same time you have to learn from it, which has to do with the cleaning of the sign. object is feeling things, although there is no emotion in them “, she reflects. After leaving the industry more than a decade ago, Kuppenheim feels that television is a very distant world. She finds that it is not up to par, the main cause of the different crises that Chilean channels have had, especially National Television of Chile (TVN). Regarding the dramatic areas, he feels sorry for the situation of the state channel and his own colleagues, who obtain an important economic support for their work there. She also confesses that she does not watch any soup opera nowadays because she finds the stories boring and the characters very stereotyped. “I always criticized that of television, and it was one of the causes of why I left it: for me nothing is pure profit, one has to make the effort and invest in quality and take charge of the social responsibility that a channel has, over Everything is public, we are no longer in the times when it is considered idealistic to think about the social responsibility of the employer, it is a basic thing, “she says. Affirms that the new generations do not wait at seven in the afternoon to watch TV series: the public is consuming other media such as Netflix and YouTube, which often offer better quality content. On the creation of a cultural channel, the actress thinks that the discussion takes a long time since certain concepts must be defined as what we understand by cultural channel or what is culture. “In the television channels culture is limited to traveling and eating, which is very interesting, but there is much more: there are good films, documentaries, interviews with writers, actors, filmmakers, sociologists, etc. You never see that in the Television, and if it exists, is a very banal content, the ability of the public to take an interest in other topics is underestimated, which is a myth, “she reflects. Aline Kuppenheim is one of the most active Chilean actresses in social networks, especially on Twitter. He uses his public profile to promote his work and that of his colleagues, in addition to sharing different contents of personal interest and, of course, his opinions on the contingency. After the appointment of Mauricio Rojas as Minister of Culture, Arts and Heritage last year, Aline, together with artists from different areas, were part of a virtual (and later real) “revolt” against him, organizing demonstrations in Santiago and demanding his resignation after the minister cataloged as a montage the story exhibited in the Museum of Memory and Human Rights. However, she believes that they are a double-edged sword. “It is a road that has to be traveled with great care, there are people who live in social networks and who are in a parallel world to the real one, as there is a lot of violence, in my case I try to control the impulses when I answer comments and not swearing .In general, I use them to promote the company and our work, “she says.